Fill a large stock pot half full with water (use a large enough pot to hold all the corn). Add in the cream, milk, sugar and butter. 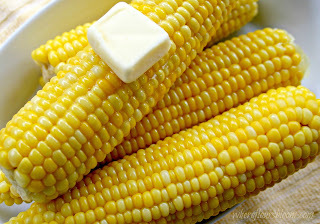 Bring to a boil, then add in the corn cobs. Reduce heat to a simmer and allow corn to cook for 7-8 minutes or until just tender, depending on size of corn try not to over cook the corn as it will become tough. Using long tongs remove and place on a plate or in a bowl, then cover with foil until ready to serve.